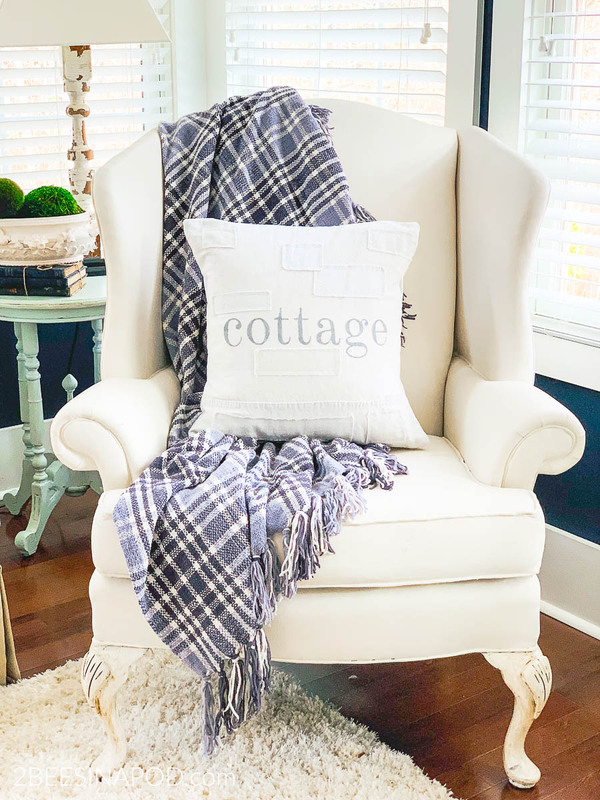 After visiting California, I was inspired to create a bit of coastal inspired home decor. 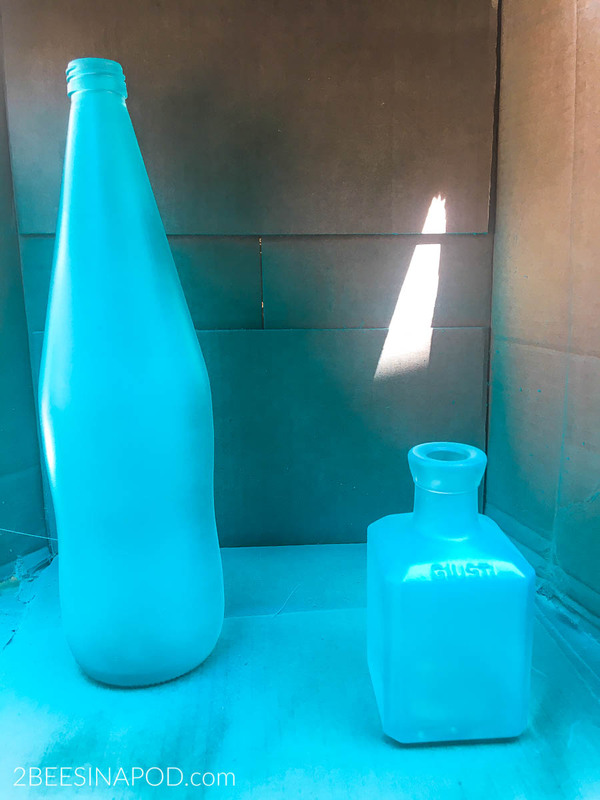 Creating sea glass bottles was way easier than I ever thought it could be. 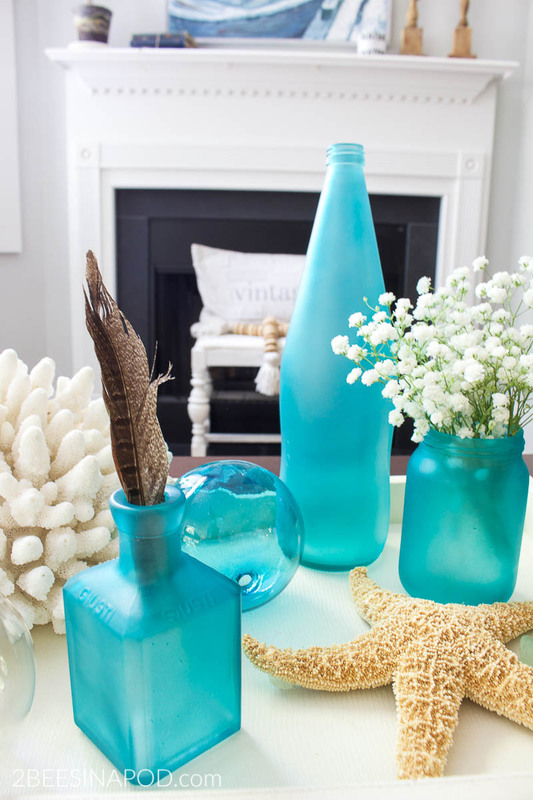 This is how to make sea glass bottles for your own home. 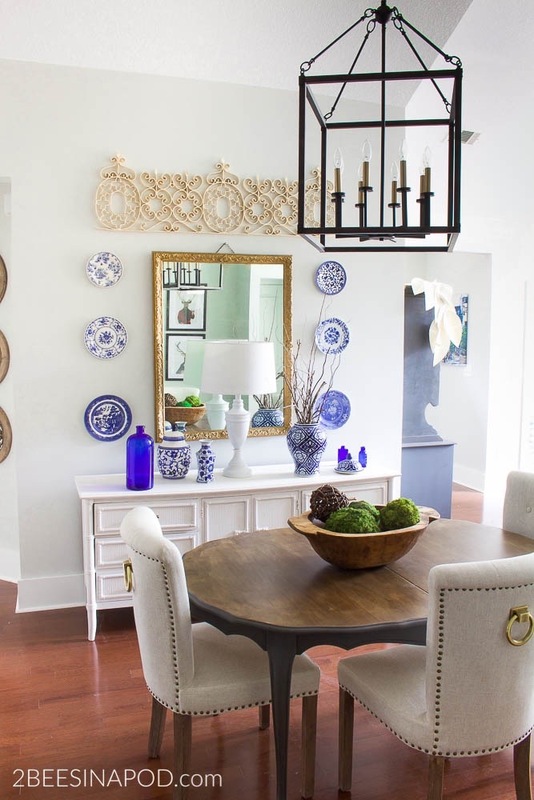 Blue and white are classic decor color choices and I use them throughout my home. On my recent trip to Los Angeles hues of bright white, driftwood, denim blue, aqua and turquoise were showcased everywhere. It was a feast for the eyes and opened creative windows that were previously dormant. Wanting to hold onto this beachy, calming, relaxing feel of vacation – I decided to make something for summer. 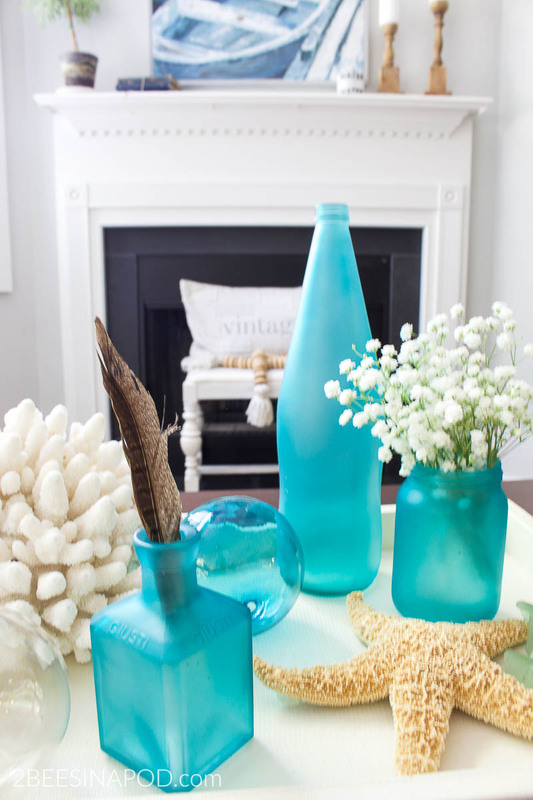 Let me show you how to make sea glass bottles. 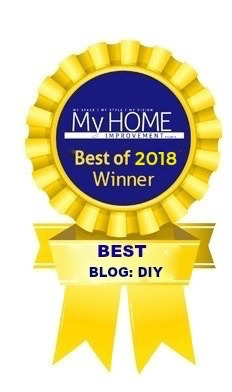 Welcome to our monthly Thrifty Style Team creativity. We are just as amazed as you are every month at what this fabulous group comes up with! 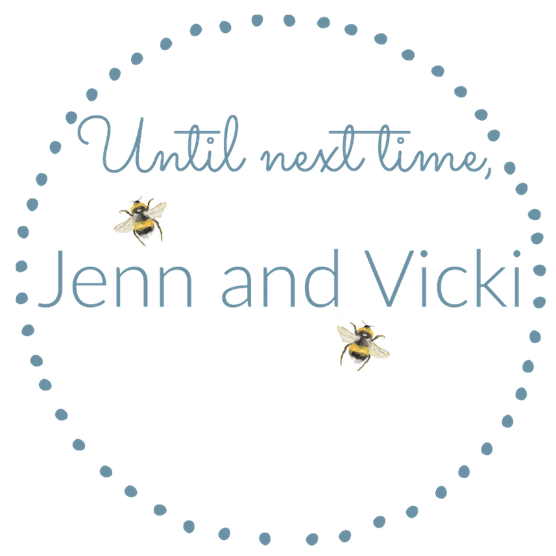 Make sure to visit everyone’s fabulousness at the end of our post. Sea glass begins as normal shards of broken glass that are then persistently tumbled and ground until the sharp edges are smoothed and rounded. 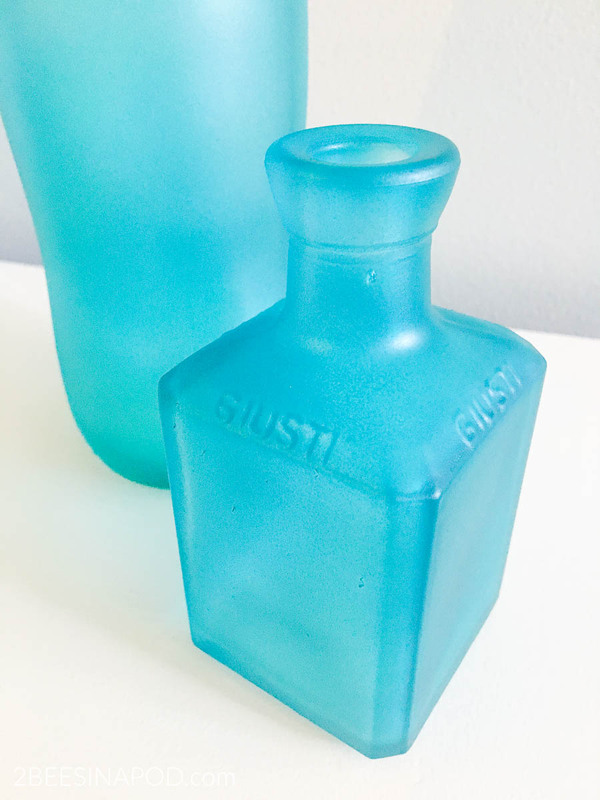 In this process, the glass loses its slick surface but gains a frosted appearance over many years. 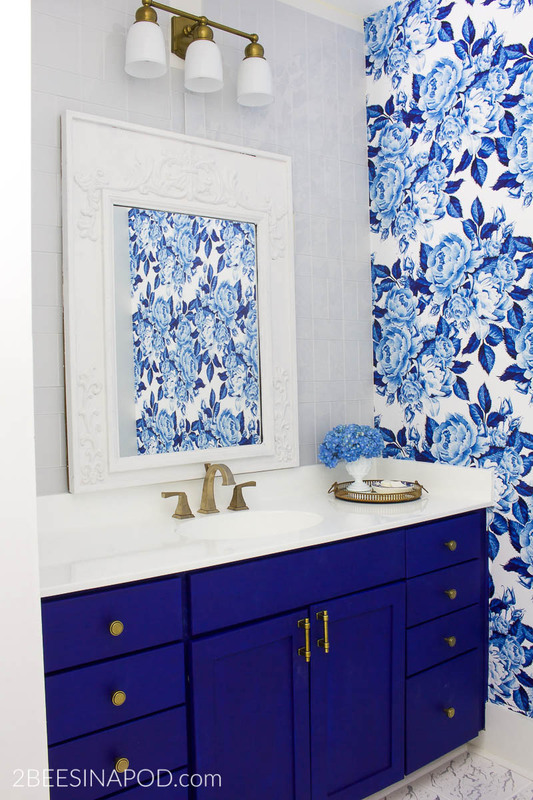 This Krylon® paint amazingly replicates this process – no need to wait 40 years! My preferred color choice was aqua. 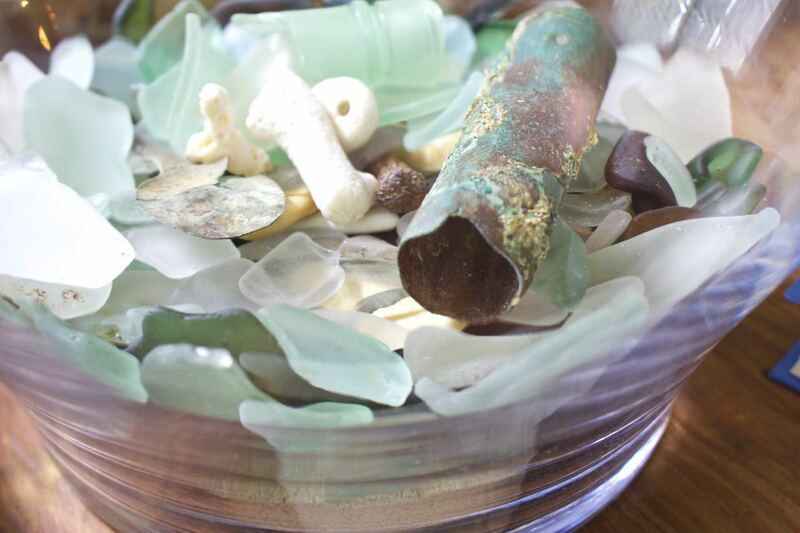 Here is my personal collection of beach sea glass. You can see how beautifully frosted all of the pieces are. 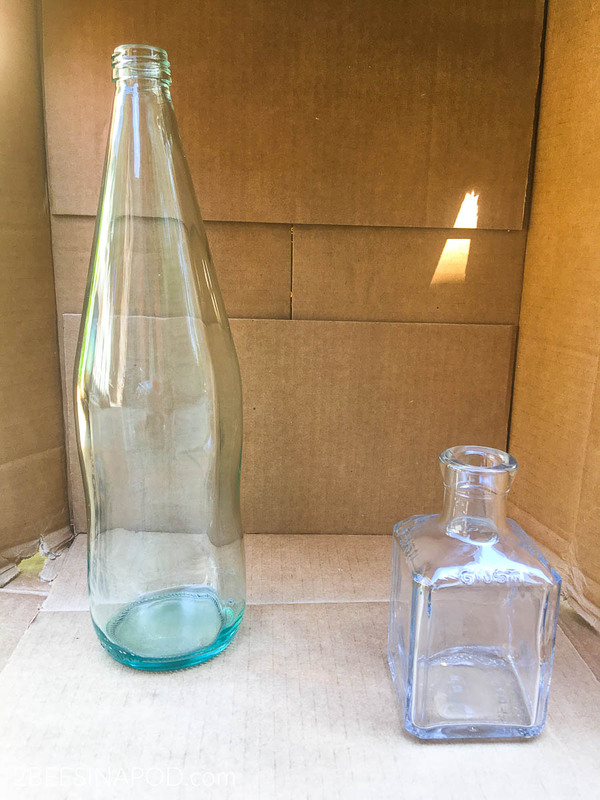 Clear glass bottles and jars. Make sure the labels have been removed and the jars are well-cleaned, free of any residue or oils. 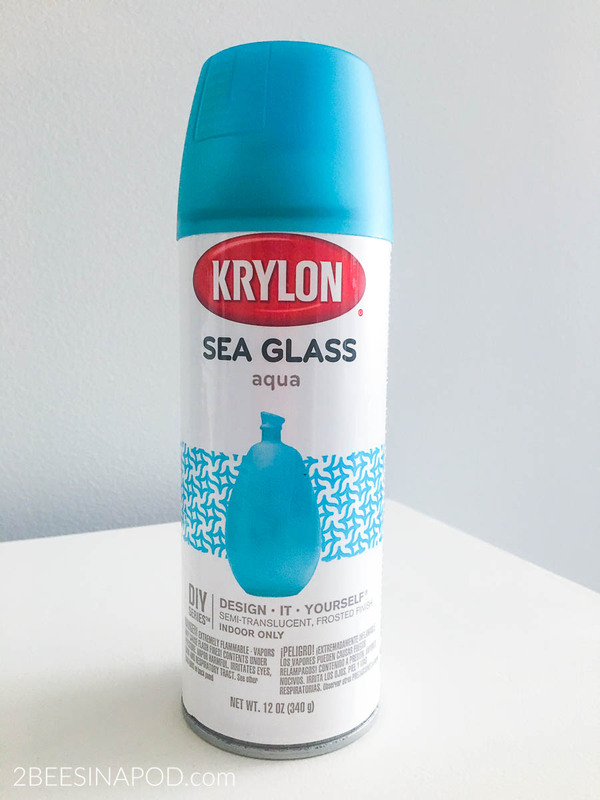 Krylon® Sea Glass Paint. I used THIS color. Other colors available: sea foam, Ice, cornflower, rose, lemon, royal purple, and amber. 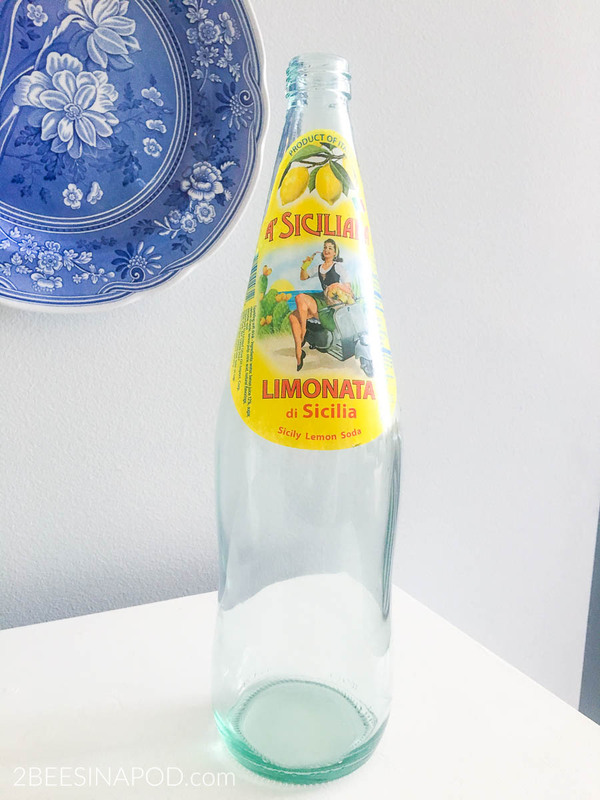 This Italian lemonade bottle had the tiniest bit of aqua color. 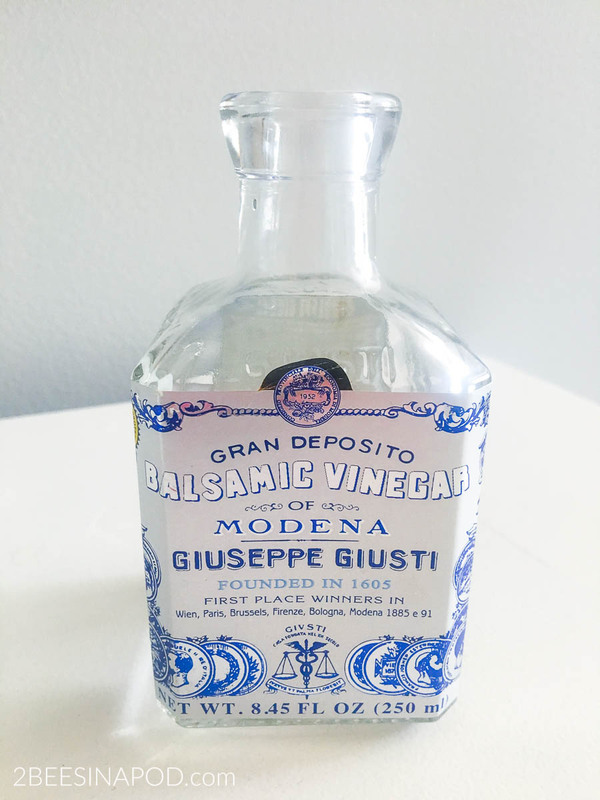 When I used the last of the balsamic vinegar, I saved the bottle because I loved it. This was the perfect project to finally use it! Place protective covering on the ground, outdoors in a well ventilated area. Put the clean bottles and jars on the covering. 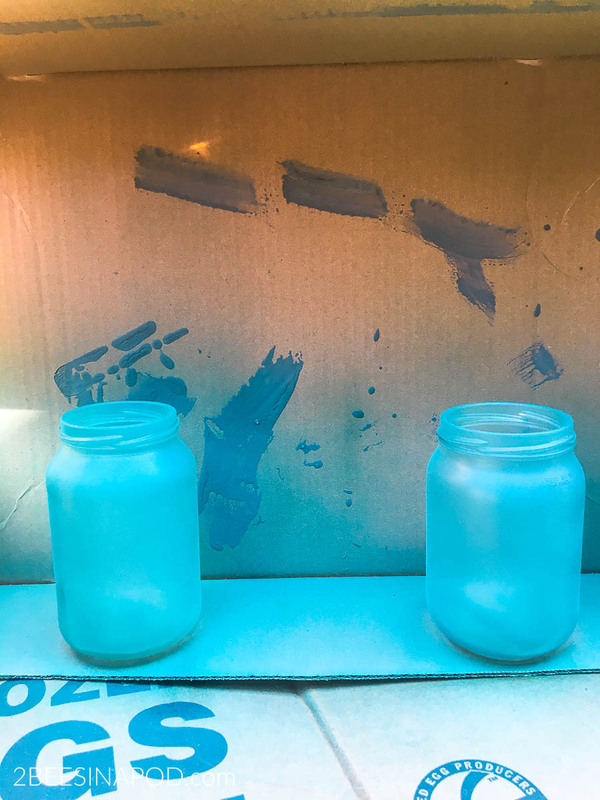 Using a very light touch, spray the front of the bottles with one coat of paint. Turn the bottles around and repeat the above steps on the back of the bottles. Remember, this paint is not like typical spray paints. You still want to be able to see through the bottles and jars. Therefore you don’t want thick coverage. Just spray very lightly to maintain the frosted effect. Look at how beautiful they turned out. 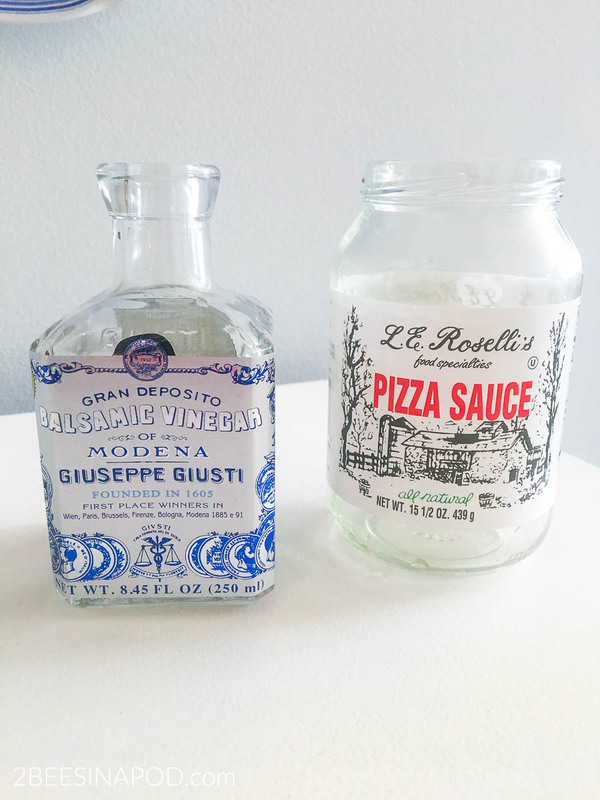 I’m so happy that I saved the balsamic bottle. They match the vintage sea float perfectly. I’d say that this was a very thrifty project. All of the glass containers were free and I received the paint free at a conference. Seriously though – the paint goes a long way. 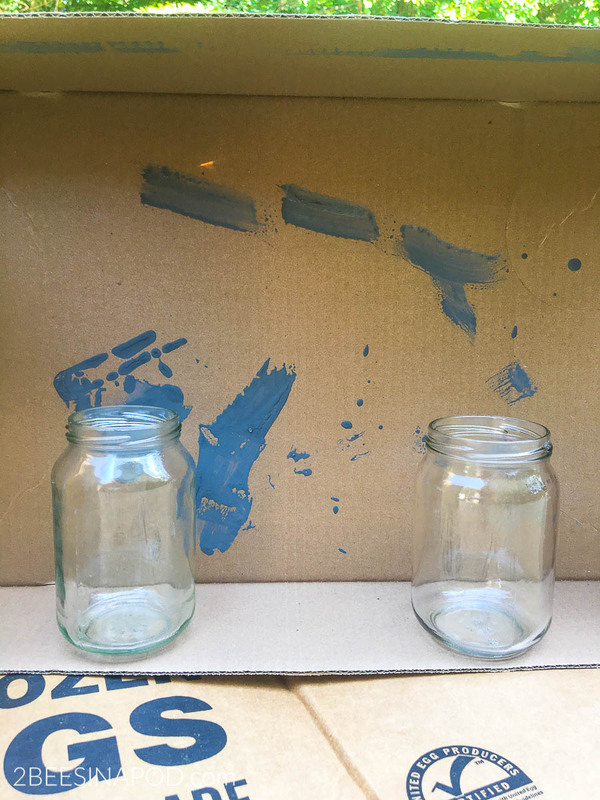 You can paint lots of glassware or better yet, buy a can and share it with family or friends. Let me know if you use this paint and how you like it! 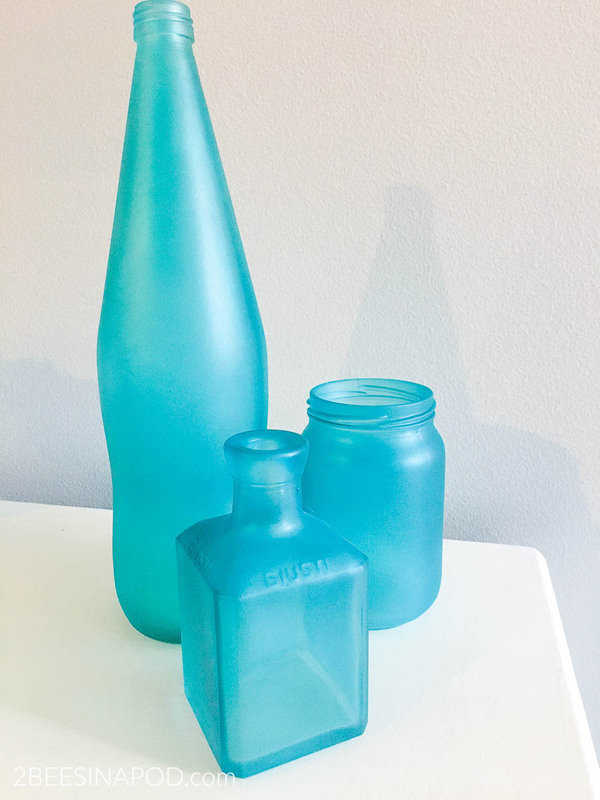 How to Make Sea Glass Bottles – who ever knew that it was this fun and easy? 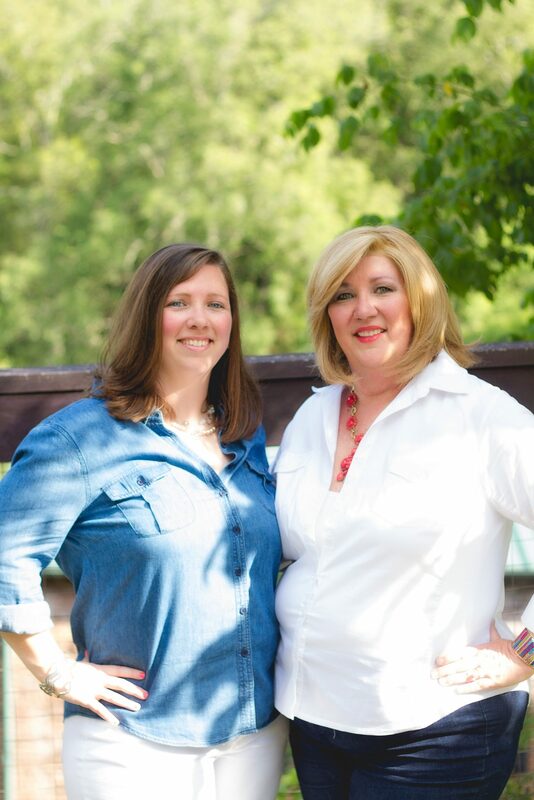 Now don’t forget to visit our Thrifty Style Team friends and their fabulous creative projects! What a pretty little beachy display. And now I want pizza. Those turned out so beautifully!! So perfect for summer! These turned out so beautifully! 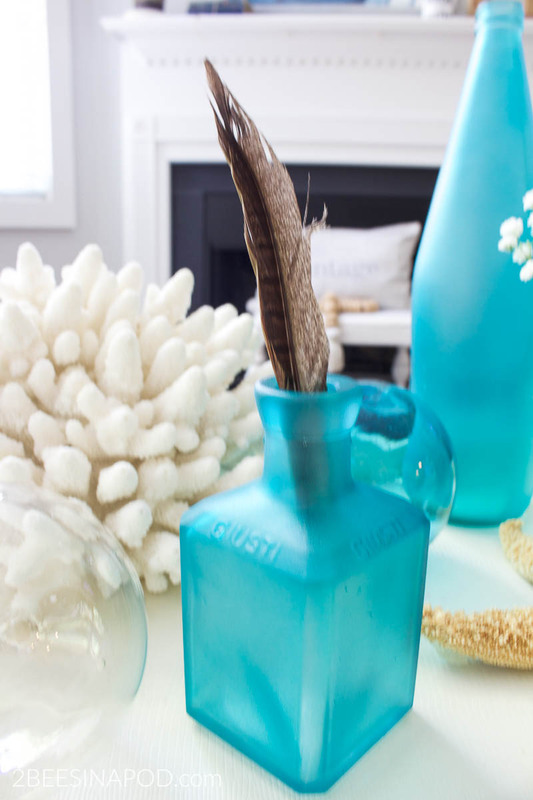 The look of sea glass is so calming and your display makes me wish I was at the beach. I am with Bliss. I want to know where to get that pizza sauce! Seriously, these bottles turned out gorgeous!! I save my favorite bottles, too, but I’m running out of cupboard!! This is such a great post! I hope you will come over and link up at TFT! I am in a beach mood and would love to feature some coastal themed posts next week! The party is live now through Saturday at midnight. Have a great weekend ahead!